In a pan fry the onion with bacon for 3-4 minutes. Remove from the heat, add mince, breadcrumbs, parsley, egg, salt and pepper and mix well. Take 1 tablespoon of the mixture and flatten into a patty shape. Place a cube of cheese in the middle of the meat, fold meat to enclose cheese and roll to form a ball. Refrigerate meatballs for 10-15 minutes. Cook in a large pan with some olive oil for about 6-7 minutes on each side on the medium heat. Meanwhile combine the tomatoes, basil, tomato paste, chilli, garlic and salt and pepper in a bowl. 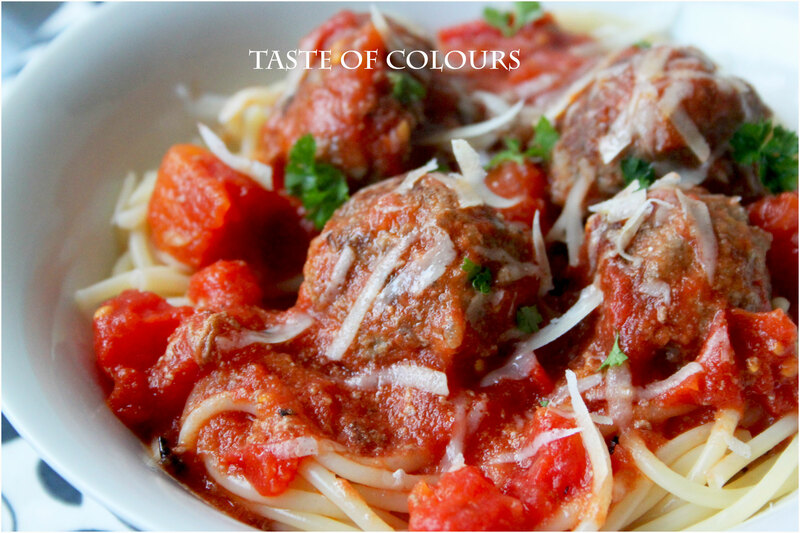 Drain any excess fat from meatballs after cooking and pour the tomato mixture over par cooked and drained meatballs. Cook uncovered on medium high for 10-12 minutes, stirring occasionally. Serve with on their own with crusty bread or over pasta. Just ate and I’m hungry all over again, LOL! This looks great! I’ll definitely be making this as soon as I get back from the grocery. Looks delicious. Your food and recipes look simply scrumptious. I’ll be coming back for more!